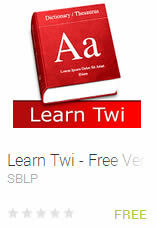 Learn Twi, Speak Twi, Translate Twi, Speak the Twi Language !!! Learn to speak Twi with MyTwiTranslator.com your premiere online resource. Learn Twi words, phrases, alphabet, nouns, pronouns, verbs, Learn Twi Language,learn twi online,translate twi to english,earn Asante Twi. MyTwiTranslator.com helps you pronounce, read and write the Asante Twi or Twi language of Ghana, West Africa. MyTwiTranslator.com is the best value for money on the internet!!! Access a vast listing of English words and phrases and their respective Asante Twi translation in an exciting and easy to use format. In addition to pictures where available there are audio clips which present the opportunity to actually learn Twi by hearing a native Asante Twi speaker enunciate each translated word. MyTwiTranslator.com will allow you to learn Twi in terms of basic everyday words in Asante Twi. Learn Asante Twi words covering several aspects of language to include, Time, weather, directions, locations, food items, feelings, emotions, opinions and ideas,numbers, days of the week, family and more. Learning Twi has never been easier!!! How does it work? See video below. Learn Twi by browsing over a 1000 English translations of Asante Twi and English words and phrases, and listen to the translated words and phrases as spoken by a native Asante Twi speaker. You are able to learn Twi words and phrases by playing an audio several times as you practice to gain mastery or the pronunciation of the Asante Twi words. Learning everyday phrases become a easy as you play the audio clips over and over.